Llano Estacado Winery has been operating in Lubbock for over 40 years. Those years have seen many events, weddings, parties and, of course, wine. The year 2015 brought big reasons to celebrate out at Llano with the opening of a new tasting room and event center. Llano’s tasting room is perfect for happy hours or small parties. The space includes cocktail tables and chairs, a wrap around patio with seating, views of Lubbock’s famous cotton fields and can hold up to 50 seated or 100 standing. Banquet Room – This 3,264-square-foot room is great for large events. The venue holds up to 200 seated or 300 standing, and facility rental includes chairs, tables and basic linens. Bridal Suite – The luxurious bridal suite is an elegant and relaxing room just for the bride and her friends on that special day. The 235-square-foot room offers a private restroom, vanity counter with five stools and mirrors, a dress rack and large floor-length mirror. Conference Room – Adjacent to the new tasting room, the conference room holds up to 20 seated, includes a flat screen television for presentations and doubles as the groom’s room for weddings. It’s the perfect space for small meetings. Vineyard – While the brand new indoor facilities are oozing with style and sophistication, the winery’s vineyards can’t be missed and are often a picturesque setting for weddings and private parties. The vineyard can hold up to 300 seated for ceremonies and includes outdoor seating. 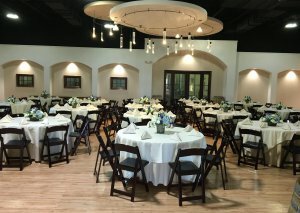 If you’re ready to learn more about Llano Estacado Winery’s event space, or are interested in information about other Lubbock event spaces, be sure to visit our website at visitlubbock.org/meet.